Continuing for one more model year before a major revision, the Allroad quattro is an SUV-flavored station wagon, based on the prior generation A6, that rides a bit higher and adds flared fenders, body stiffening, and extra under-body protection. 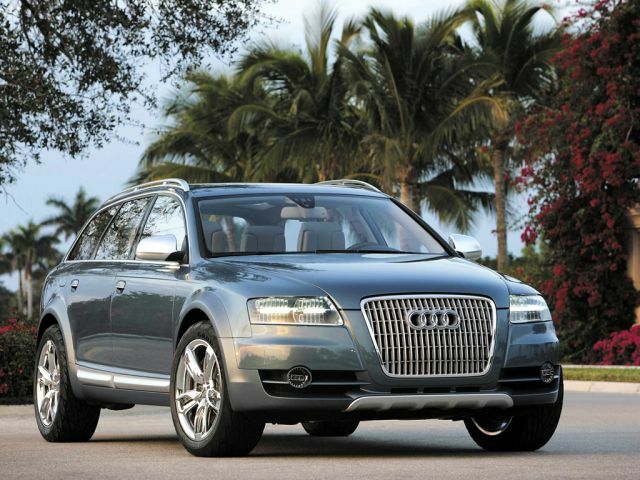 Powered in its base form by a 2.7-liter turbocharged V-6, a 4.2-liter V-8-equipped version was added to the Allroad line last year; at 300 horsepower this becomes one of the quickest and sportiest station wagons available. A four-position pneumatic ride-height adjustment allows the driver to vary the allroad's ground clearance all the way up to 8.2 inches. Audi's quattro all-wheel-drive system provides solid road holding and cornering capabilities over a wide range of road and weather conditions. Four-wheel disc anti lock breaks with Electronic Brakeforce Distribution and Rear Differential Lock, Electronic Stabilization Program, and front-side airbags all come standard with side airbags for rear seat passengers optional. Available comfort and convenience items include a Bose audio system, rear Parktronic proximity alarms, a GPS navigation system, heated seats, and (on the 4.2) a heated steering wheel.